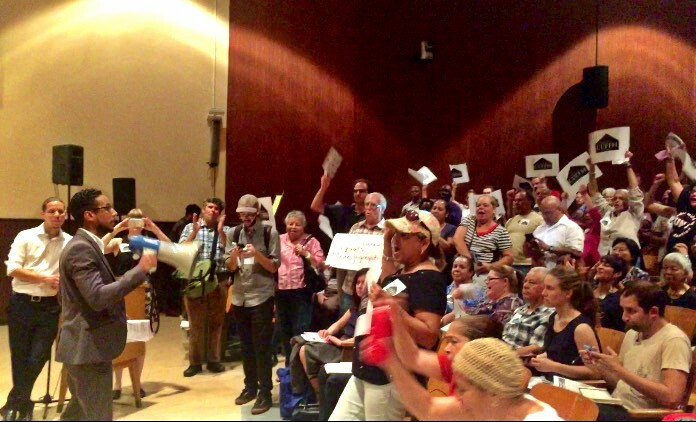 On Wednesday night, September 21, 2016, Brooklyn Legal Services Corp. A. participated in a protest against a Pfizer plant rezoning proposal that upended a City Planning public scoping session. The rally was led by Broadway Triangle Community Coalition (BTCC), a coalition of over 40 community partners, including Brooklyn A, that galvanized hundreds of concerned residents to protest a discriminatory plan developed without their community’s input. The Department of City Planning barely introduced the meeting before a BTCC member stood at the podium in Intermediate School 318’s auditorium and said, “Stop! This plan is not for us.” After this proclamation, 30 minutes of protest ensued, until the meeting was ultimately shut down. The lively hundreds of protesters chanted “Shut it Down,” and “Si Se Puede,” while waving posters condemning the proposal’s segregatory nature, developer, and lack of inclusive, affordable housing. The BTCC advocates for indiscriminate fair housing in the Broadway Triangle and believes the proposed development plan will harm the community more than help. The developer, the Rabsky Group, has a poor record of reneging on affordable housing agreements while benefiting from tax breaks. Supporters Councilmember Antonio Reynoso of District 34, and Evelyn Cruz, a Community Coordinator for Congresswoman Nydia Velazquez, spoke during the protest against the lack of community input in the plan. The Broadway Triangle area has a long history of housing discrimination and tenant harassment that has not been properly addressed by city government. The BTCC calls for Mayor Bill de Blasio to provide a solution to the outstanding issues before bringing in new developments that will further perpetuate problems. Read more about Wednesday night’s rally on Gothamist. At Brooklyn A, we count on your support so we can continue to support our community coalitions fighting for fair housing like the BTCC.